We're going to dispense with a lot of the introductory commentary for all of our gaming benchmarks, as we already have a ton of material to present. At this point, most of you are already familiar with what benchmarks we use and how they are run. If not, you should easily be able to find the information in a previous article. So, rather than adding hundreds of words of repeat text, we're just going to cut straight to the chase and talk about performance. Starting with Company of Heroes, we have a game that really stresses the graphics card at higher settings, though in the past we've also shown that it tends to be CPU limited with different detail settings. Running maximum details, all of the cards still managed to deliver acceptable gameplay at 1600x1200 or lower resolutions. 1920x1440 is still playable as well, but if you have a 30 inch LCD running 2560x1600 and you want to run with antialiasing, you're really going to need a GeForce 8800 series card. 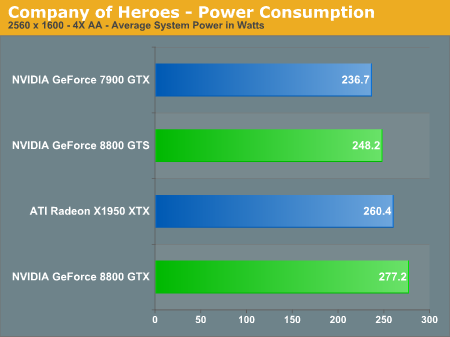 The GeForce 8800 is clearly more powerful than anything ATI currently offers, which is to be expected as it's a next-generation card competing with current generation hardware. What's impressive is that the 8800 GTX is basically as fast running 2560x1600 as the GeForce 7900 GTX or Radeon X1950 XTX running at 1600x1200. Put another way, a single 8800 GTX is over twice as fast as a single X1950 XTX in all of the tested resolutions, and it's also about twice as fast as a 7900 GTX. 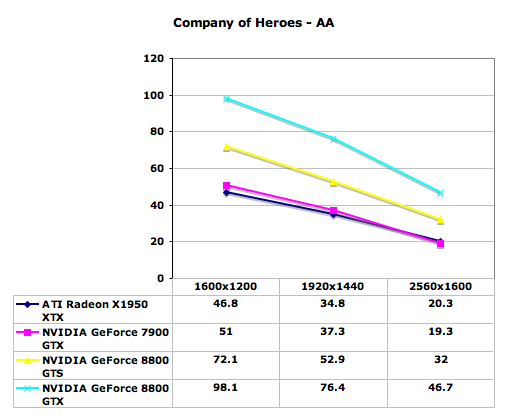 As far as multiple graphics card configurations go, Company of Heroes currently did not show any performance improvements. Most likely that means that NVIDIA and ATI drivers have not been properly optimized for this game at present. This is a problem that occurs periodically with new titles, and it's always frustrating to get a new game only to find out that it isn't properly using your hardware -- especially if you've shelled out the money for dual graphics cards. 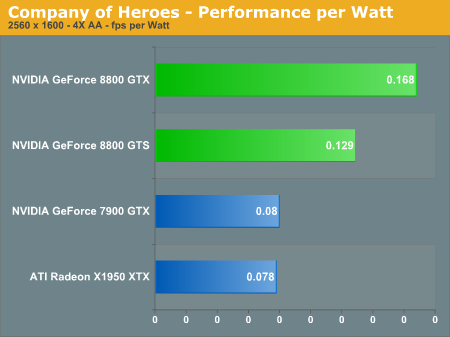 This is why we have repeatedly recommended in the past that you purchase a faster single graphics card rather than moving to dual GPUs, up to the point where you basically have the fastest single graphics card available. 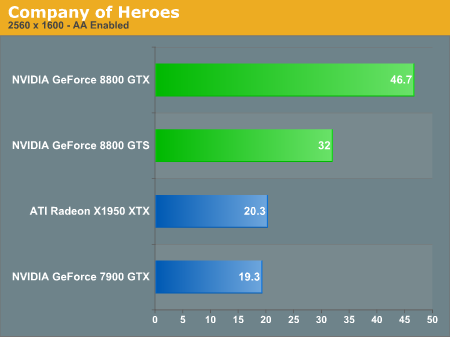 GeForce 8800 GTX now holds the title of fastest single GPU, so if you were previously looking to spend $800 on a couple of GPUs, you should seriously consider a single 8800 GTX instead. The DirectX 10 support is merely icing on the cake.